A cast iron skillet is an essential component of any Tennessee kitchen. The famous Lodge Cast Iron company, based in South Pittsburg, Tennessee, was founded in the late 1800s and has influenced the Southern culinary scene ever since. I use a cast iron skillet regularly in the kitchen, and although I love a good butter-based Southern meal, I usually try to make my favorite Southern staples healthier to fit my family’s active lifestyle. It’s easy to modify traditional recipes into healthy cast iron skillet recipes. Using a cast iron skillet adds iron to your food, and nutritious veggies take on a lovely caramelized flavor. 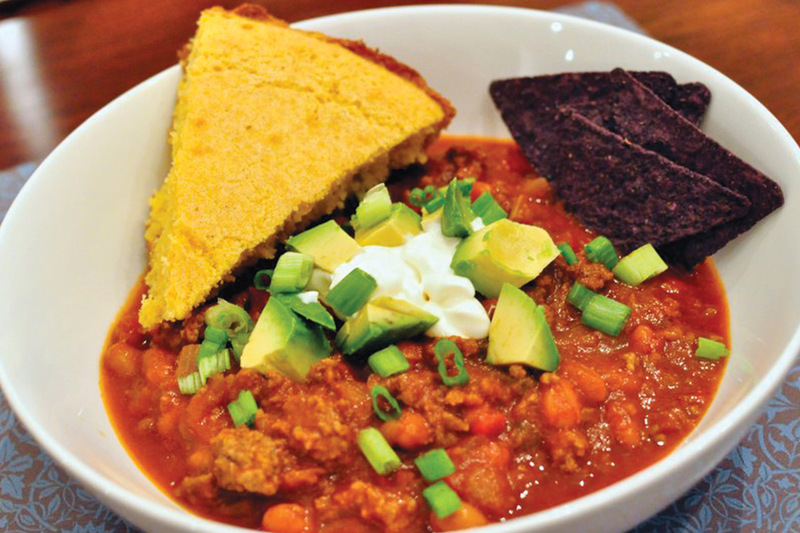 I lightened up a classic corn bread dish by reducing sugar and cutting out sour cream (but still preserved a rich flavor through buttermilk), then and added added extra beans and veggies to a traditional beef chili recipe for some healthy fiber and vitamins. Get out your cast iron and host a Southern feast with these healthy cast iron recipes. Optional toppings: Sour cream, avocado, cheddar cheese, chives, cilantro or tortilla chips. Heat olive oil in a large cast iron Dutch oven over medium heat. Add garlic, onions and bell peppers and sauté. Add ground beef and cook until browned, about 10 minutes. Stir until meat separates and crumbles. Drain excess fat from Dutch oven. Add remaining ingredients, stir, cover and simmer for 30 minutes or up to five hours. Serve with skillet cornbread and the toppings of your choice. Place 10-inch cast iron skillet into oven and preheat to 450 degrees. While oven and skillet heat, mix together dry ingredients in a large bowl. Whisk buttermilk, eggs and honey together in a small bowl. Remove skillet from preheated oven and place butter into hot skillet. Return skillet to oven and melt butter for about one minute. While butter melts, add wet ingredients to dry ones and combine. Remove skillet from oven and quickly pour hot butter into the mix, stirring everything together. Pour mixture into skillet and bake for 15-20 minutes, until the cornbread edges are browned and peeling away from the skillet. Ready to cook more with your cast iron? Check out Lodge’s recipe page for healthy cast iron skillet recipes. Do you cook with a cast iron skillet? Let us know your favorite recipes by commenting below.